North America was one of the focal points of the global, Great Recession. While Canada has managed to return its economy nearly to the levels it enjoyed prior to the recession, the United States and Mexico are still under the influence of the worldwide economic slowdown. The cost of staple items dropped dramatically in the United States as a result of the recession. 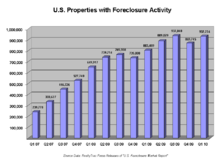 The United States entered 2008 during a housing market correction, a subprime mortgage crisis and a declining dollar value. In February, 63,000 jobs were lost, a 5-year record. In September, 159,000 jobs were lost, bringing the monthly average to 84,000 per month from January to September 2008. Canada was one of the last industrialized nations to enter into a downturn. GDP growth was negative in Q1, but positive in Q2 and Q3 of 2008. The recession officially started in Q4. The almost 1-year delay of the start of the recession in Canada relative to the U.S. is largely explained by two factors. First, Canada has a strong banking sector not weighed-down by the same degree of consumer-related debt issues that existed in the United States. The United States economy collapsed from within, while the Canadian economy was being hurt by its trade relationship with the United States. Second, commodity prices continued to rise through to June 2008, supporting a key component of the Canadian economy and delaying the start of recession. In early December 2008, the Bank of Canada, in announcing that it was lowering its central bank interest rate to the lowest level since 1958, also declared that Canada's economy was entering in recession. The Bank of Canada has since announced that it has two consecutive months of GDP decline (Oct -0.1% & Nov -0.7%). The country's unemployment rate could rise to 7.5% in the next two years, according to the latest OECD report. On July 23, 2009, the Bank of Canada officially declared the recession to be over in Canada. However, the true economic recovery did not begin until November 30, 2009. The Canadian economy would expand at an annualized rate of 6.1% in the first quarter (January–April) of 2010, surpassing analyst expectations and marking the best growth rate since 1999. Economists had expected annualized GDP growth of 5.9% in the last quarter, up from 5% in last year's fourth quarter (September–December 2009). The growth in the first quarter is the third straight quarter of economic expansion in Canada, coming on the heels of three consecutive quarters of contraction. March growth came in at 0.6%, ahead of the 0.5% estimate. 215,900 new jobs have been created in the winter and early spring months of 2010 alone - in the traditional period of time where the Canadian economy is at its most stagnant. Even with the steps taken to create jobs in the Canadian economy, its recovery remains fragile and job cuts can still be seen in areas that specialize in manual labour. Canada was also in a recession during the first two quarters of 2015 average both a decline of 0.1 percent of GDP. Despite the solid financial system of Mexico, the effects of the financial crisis originated in the United States impacted Mexico's export sector by a significant amount considering that 85% of the country's exports go to the United States. Reduced demand, the highest unemployment rate in almost a decade and the depreciation of the Mexican peso caused analysts to revise growth estimates officially from 1.8% to somewhere closer to 0% for 2008. Economic recovery from the historic downturn started in the late 2009 with exports rising 22.8 percent. The economic prospects for 2010 in the early 2009 were of a positive growth of 3.5  and some saw a steady recovery by the second quarter of 2010. At the end of 2010, the OECD revealed an estimated growth of 4.5 percent while the Mexican government estimated a growth of over 5 percent and the creation of 730 thousand jobs. The estimated growth for 2011 range from 3.9 to 4.8. Despite the sustained growth in 2010, it was not enough to cover up the loss of 2009. As it mainly consists of commodity exporters, South America was not directly affected by the financial turmoil, even if the bond markets of Brazil, Argentina, Colombia and Venezuela have been hit. On the other hand, the continent experienced a tough agricultural crisis at the beginning of 2008. Food prices have increased a lot, due to a lack of arable land. One of the main reasons for the loss of agricultural land was the high value offered by the production of biofuels. Food prices, rising since 2002, ascended from 2006, reaching a peak during the first quarter of 2008. In one year the average price of food rose by about 50%. Then South American countries were affected by both the global slowdown and the decrease in food prices due to the declining demand. In June 2008, the Economic Commission for Latin America and the Caribbean (ECLAC) declared it expected a 4% growth for 2009. However at the end of the year it predicted that the year 2009 would put an end to six years of prosperity during which Latin America has benefited from high raw materials prices. Production in the region is likely to decline and unemployment to increase. However, the Center for Economic and Policy Research has estimated that the region may be able to cope with the global downturn with the right macro-economic policies, as these countries no longer depend on the U.S. economy. ^ "dollar hits record low against euro, oil prices rally". Archived from the original on 5 October 2013. Retrieved 6 February 2009. ^ Aversa, Jeannine, "Employers Slash 63,000 Jobs in February, Most in 5 years, Feeding Recession Fears,", Associated Press, March 7, 2008. Accessed July 11, 2008. ^ "Historical Changes of the Target Federal Funds and Discount Rates". Federal Reserve Bank of New York. 2008-12-22. Archived from the original on 21 December 2008. Retrieved 2009-01-04. ^ "Canadian banks are the soundest in the world: report". Archived from the original on 2008-10-11. Retrieved 2008-10-09. ^ "Canada 'entering a recession,' central bank slashes key rate to 1.5 per cent". OTTAWA: The Canadian Press. 2008-12-09. Archived from the original on 17 December 2008. Retrieved 2009-01-04. ^ Elisabeth Malkin (December 30, 2008). "Mexico's Prudence Fails to Avert a Slowdown". Mexico; United States: NYTimes.com. Retrieved 2009-01-04. ^ New, The (December 29, 2008). "Recession is spreading from U.S. to Mexico's economy". Dallas Morning News. The New York Times. Retrieved 2009-01-04. ^ ""Subprime": lejos de A. Latina" (in Spanish). BBC Mundo. August 1, 2007. Retrieved 2010-01-05. ^ "Latin America risks reverting progress in poverty reduction / Global financial crisis will affect region's trade with the rest of the world" (PDF). ECLAC. December 2008. Retrieved 6 February 2009. ^ "Preliminary overview of the economies of Latin America and the Caribbean 2008". ECLAC. December 2008. Retrieved 6 February 2009. ^ "Growth in Latin America and the Caribbean Is Projected to Be 1.9% in 2009". ECLAC. 18 December 2008. Retrieved 6 February 2009. ^ "Amérique latine : fin de six années de croissance soutenue" (in French). RFI. 2008-12-19. Archived from the original on 1 February 2009. Retrieved 6 February 2009. ^ "South America: Recession Can Be Avoided". CEPR. November 16, 2008. Archived from the original on 18 January 2009. Retrieved 6 February 2009. ^ a b "Quarterly National Accounts : Quarterly Growth Rates of real GDP, change over previous quarter". Stats.oecd.org. Retrieved 2013-08-17. This page was last edited on 23 October 2017, at 02:08 (UTC).